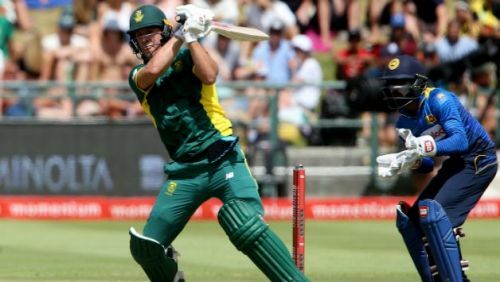 The hosts South Africa whitewashed Sri Lanka by winning the 5th and final ODI played at Newlands Stadium, Cape Town on Saturday. It was a dominant display by South Africa who restricted Sri Lanka to a modest total and then chased down the target with ease. Sri Lankan captain Lasith Malinga won the toss and decided to bat first. It was a poor start again by Sri Lanka as they lost two early wickets - of Upul Tharanga and Avishka Fernando. Oshada Fernando and Kusal Mendis then steadied the innings with some lovely stroke-play. At the end of 10 overs, Sri Lanka were 36 for 2. The two added 49 runs for the 3rd wicket before Imran Tahir dismissed Fernando for 22 runs. Mendis and Angelo Perera then put up another important partnership of 62 runs for the 4th wicket. Mendis soon reached his fifty, off 72 balls. But Sri Lanka then lost a flurry of wickets and found themselves in big trouble at 161 for 7. Isuru Udana and Priyamal Perera did a bit of a rescue job with a valuable partnership of 61 runs for the 8th wicket. However, their resistance eventually came to an end and Sri Lanka were bowled out for 225 in 49.3 overs. For South Africa, Kagiso Rabada took 3 for 50, while Imran Tahir picked up 2 for 32. Chasing the target of 226 runs to win, South Africa lost the early wicket of in-form batsman Quinton de Kock for 6 runs. Faf du Plessis and Aiden Markram then played with positive intent, and at the end of 10 overs, South Africa were 40 for 1. Both batsmen continued to put pressure on the Sri Lankan bowlers, before Du Plessis was dismissed for 24. The two had added 70 runs for the 2nd wicket. Markram soldiered on, and reached his fifty off 58 balls. He and Rassie Van der Dussen added an unbeaten 57 runs for the 3rd wicket before play was stopped due to the lights not working. The match was eventually called off and South Africa were declared winners by 41 runs, through the DLS method. Brief scores: South Africa 135 for 2 in 28 overs (Aiden Markram 67*, Rassie Van der Dussen 28*, Lasith Malinga 1/22) beat Sri Lanka 225 in 49.3 overs (Kusal Mendis 56, Priyamal Perera 33, Kagiso Rabada 3/50, Imran Tahir 2/32) by 41 runs via D/L method.